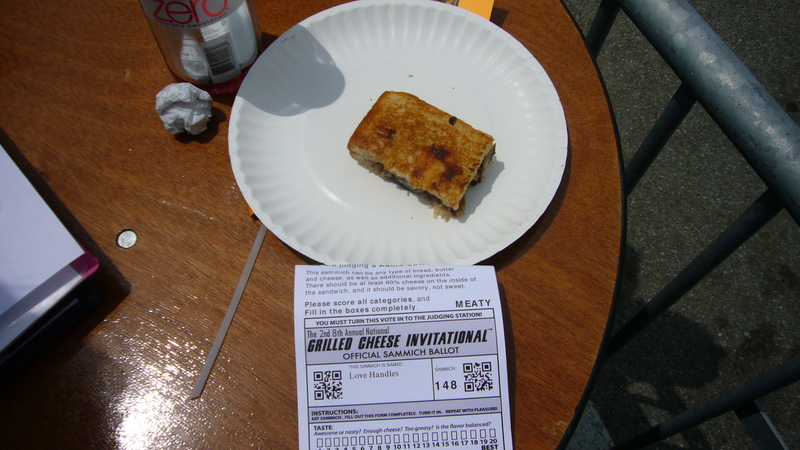 The 2nd 8th Annual Grill Cheese Invitational! That time of year again folks! 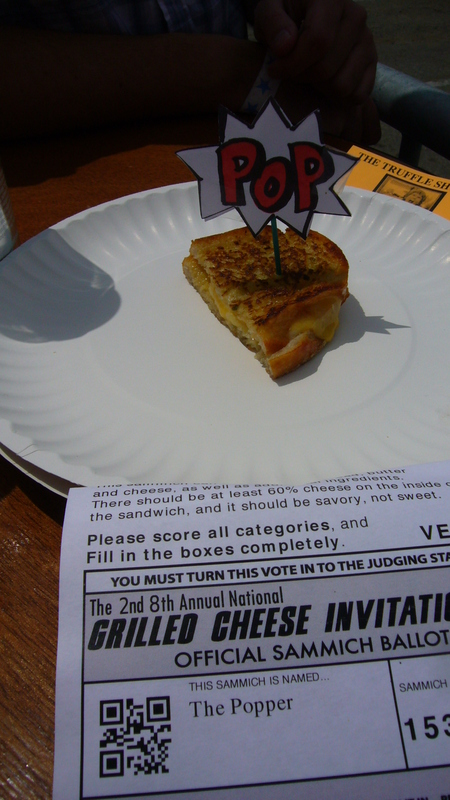 The 2nd 8th Annual Grilled Cheese Invitational held in downtown Los Angeles has arrived! Time to don your bright orange clothing and dress up in “cheesey” gear! Most people reminded me of cantaloupe to be honest, but that could be because I am eating some right now. There will never be a happier group of people than that of people going to eat creations of melted cheese and carbohydrates. I went with three other friends and it all worked out perfectly.We were able to stand together and try many different samples without getting ill. and I had a great time and tried many different recipes of cheese and bread and meat and sweet. Good stuff! This is the isle where GC docents hand off the creations to we the judges. 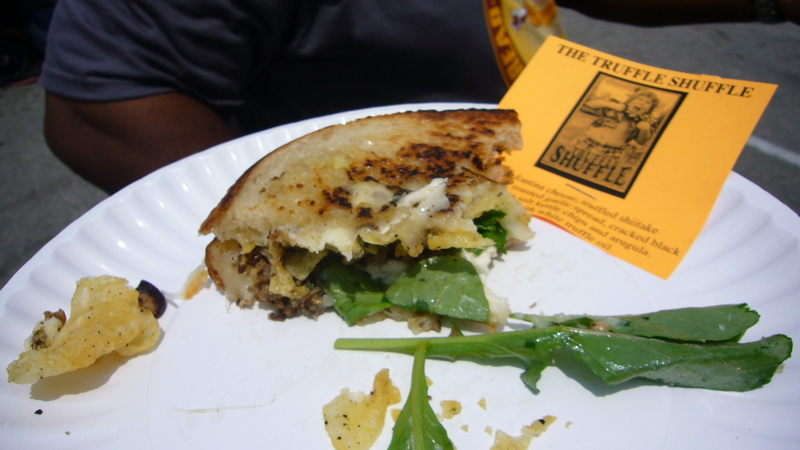 This was the first GC Sammy we tried and it was a truffled shitake mushrooms w/ jack cheese, arugula and Kettle chips. The GCI docents handing off GC to eager judges! They were the bringers of cheese joy! The loves handles had pulled pork and some kind oyster sauce or soy mixture on the inside. The Popper had used Jelepno cheese and tasted like jelepeno poppers. This GC sammy we loved the most for the basic GC sandwich! 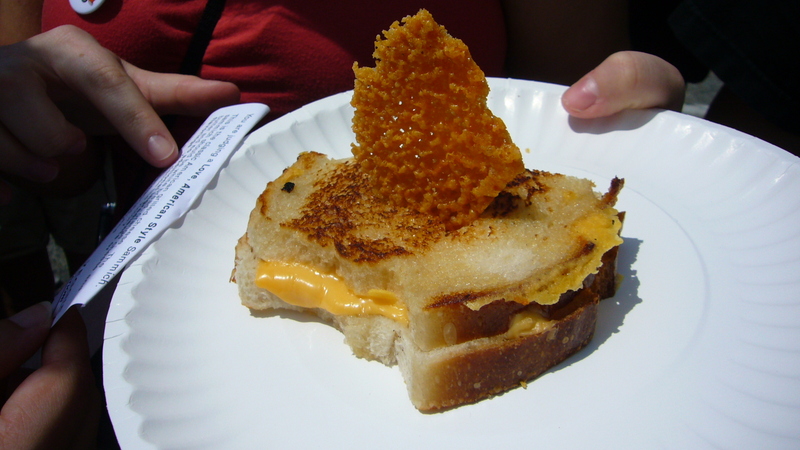 It had plenty cheese flavor, smooth cheese inside, cripsy and buttery outside. The baked cheese crisp on the top was delish! I had a lof of fun this year the GCI. I thought it was much more organized than last years and there seemed to be a lot more space to move around. Last year the was a miasma of lines leading from on truck to another and I didn’t know what line went to what because they were all interconnecting. The only one that made any sense was the beer garden line and that was because it was moving the fastest. This year they had it all placed nicely. Yes there were lines, but I could tell where they were all going to and vendors were serving up nice portions so that if I wanted to get a lot of tastes in I could. 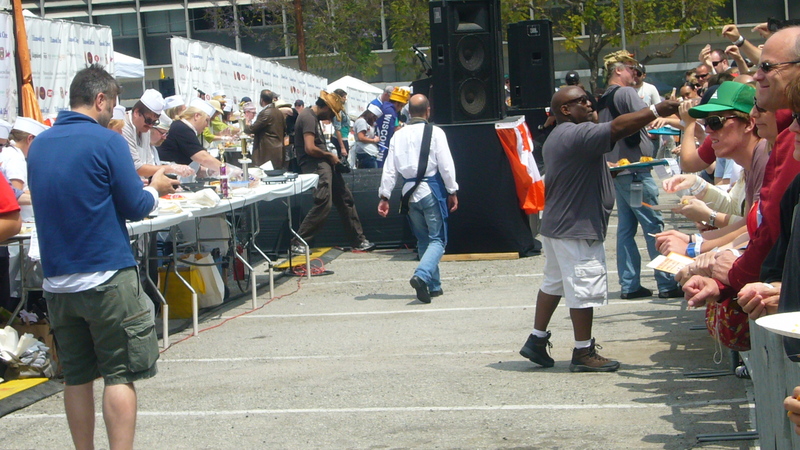 As it was, I was pretty full from judging that I didn’t bother waiting in any of the food truck lines. I still have dreams of trying the Grill Cheese Trucks Pulled Pork and Mac Grill Cheese Sandwich! I think I might die if I eat that though. Like I my heart might feel like my stomach does after eating a big bowl of oatmeal! Haha! I hope everyone who came out yesterday had as much fun as I did. I am greatly anticipating next year and to see what make come! Maybe next year I’ll dress up in crazy orange colors too! ← I put salt on my cereal one time thinking it was sugar. This looked like a lot of fun. 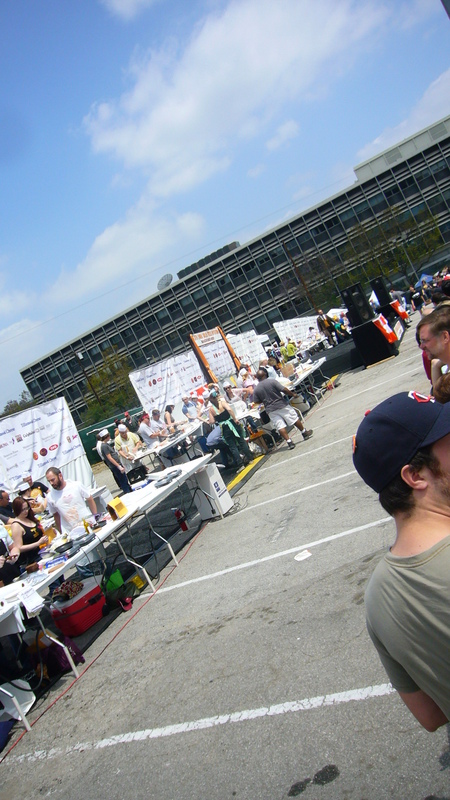 I always enjoy learning about the foodie events you go to. Alas I was not able to attend this event. Sigh… hopefully next time I will be able to go. That last sandwich was amazing and creamy! i want to try to make when I loose a bit of weight that I gained from this festival! Those are some great close ups of the sandwiches! Awesome! I hope you had as much fun as I did!